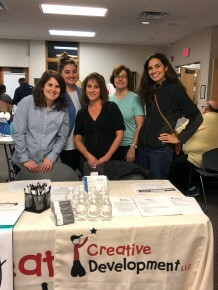 On October 25, 2017 the Creative Development Team was part of this important resource fair. Not only did we meet some great families, we saw many familiar faces taking advantage of this wonderful and we met new professionals who we look forward to collaborating with! This is a link to download our 2016 summer group programs PDF document. Contact Jessica Tuthill at 860-284-9779/jessica@creativedevelopmentct.com for more Info! Creative Development continues to offer Professional Development Programming to a variety of communities and continuously strives to stay connected/collaborate with as many professionals as possible working with children. The community outreach and collaboration among all professionals in order to assist children with becoming successful, independent members of their community. Please call 860-284-9779 or email Jessica@creativedevelopmentct.com to collaborate or to schedule a Workshop! As seen on Better Connecticut, learn more about how sensory integration and occupational therapy can help your child.